Thanks for all your writings, peeps. Suddenly I feel more knowledgeable! 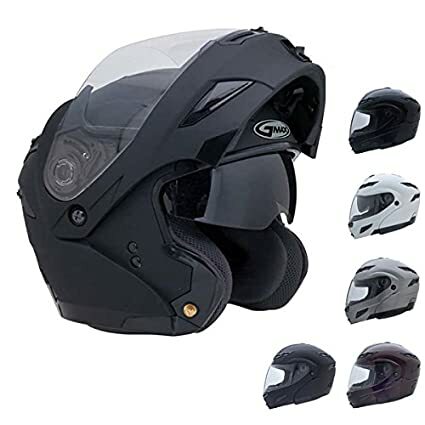 FYI I have this GMX helmet and it's great or the price. I also bought the wireless brake light kit. Worked great. Until. I hit some torrential rain this summer and the brake light compartment is decidedly NOT waterproof. When I got home I noticed the light was on even though it was off. I couldn't turn it off either. It ran for like four or five days. Went down last night and my helm seemed to transmit a heck of a lot more force than I would have suspected. I use an '08 HJC basic model. What got me is that after 15 years of WMA Armored Combat I know a bit about being hit in the head, and I'm just really surprised folks in the motorcycle helm industry are not taking notice as a number of folks in my hobby have gotten their combat helmet's DOT approved. I know my combat helm is like $800 new but visoelastic polymers aren't that much, nonnewtonian fluids are out there, and 3+ stage padding isn't that hard to make. Heck I find it hard to believe that a solid lance, sword, or poleaxe strike is harder than asphalt. I know that part of the protection is the deformation and energy absorption of properly tempered mild & spring steel but still. Last edited by Sean Karp; 04-06-2015 at 02:17 AM. I don't think that's DOT approved. You can wear it, but only if you are riding a horse. Perhaps you got hit in the head a few too many times? Oh I wouldn't wear it, I mean leather & synthetics ablate, but steel skips. However physics is physics and coming off a horse at 25-30 mph from 5+ ft up isn't, according to that cool little PDF posted up (much appreciated BTW), that much different and jousting helms are used over and over. It makes me think the two communities aren't communicating. BTW lots of guys into armored combat are into bikes, so picture this: A guy in full kit goes around a bend and gravel has him skit out. Bike lays down at 50 MPH. Guy hits ground & is just like "darn, how am I gonna get home?" cause his kit saved every bit of him, however he discovers he's skipping down the road trailing sparks cause steel doesn't ablate like leather, and the cliff he's coming at is coming fast. Lucky he hit the dirt, flanges, tassests and whatnot catch and he comes to a halt none too soon. From then on he wore his leathers on his body even if he still sometimes wore the steel helm. Used to road race with a guy that put a strip of steel in his knee pucks. He'd go into a turn and leave a trail of sparks as he lightly touched his knee down. Motorcycle helmets are made to take forces differently than combat helmets. You rarely have a direct impact crashing a bike. If your going 35 mph when your head touches down, impact is really a tangent. You're still "falling" at the same speed you would be if the bike wasn't moving.